The Fairytale of Death is an inspiring story of a little Soul who is about to make her first journey to Earth. In a pleasant and simple way, this book answers questions such as: what happens before we travel to Earth and what does it feel like for a soul to be born in a human body? How does a soul experience life on Earth? And finally, how does a soul experience the dying process, or the return Home? One day, while she was dreaming about what it would be like on Earth, she suddenly heard a voice that said: ‘Would you really like to go to Earth?’ Surprised, she looked up. An old man with a long white beard was standing next to her. He gave her a friendly smile. ‘Who are you?’ the Little Soul asked. ‘I’ve never seen you here before.’ ‘I am here to make you an offer,’ the old man said. He sat down on the grass and invited the Little Soul to come and sit next to him. ‘I’ve seen you sitting here several times and I’ve always heard you say that you would really like to go to Earth. I am here to tell you that it is possible if you really want to.’ The Little Soul stared at the old man in surprise. ‘Is it really possible, just like that? But how? Earth is sof ar away; I can’t go there just like that.”No, not just like that,’ the old man said. ‘Many things will happen before you can go, but it is possible.’ The Little Soul jumped up and started dancing. ‘Hurray,’ she shouted, ‘my dream is coming true. I am going to Earth! Ever since in her childhood Marie-Claire van der Bruggen (1969) was aware of a world that other people couldn’t perceive and where she felt very much at ease. After a long search she found answers to many of her questions. 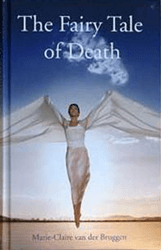 With this book she wants to inspire other people to remember who they really are and where they really come from; and most importantly, she hopes to take away the fear of dying.